NMM 14414. 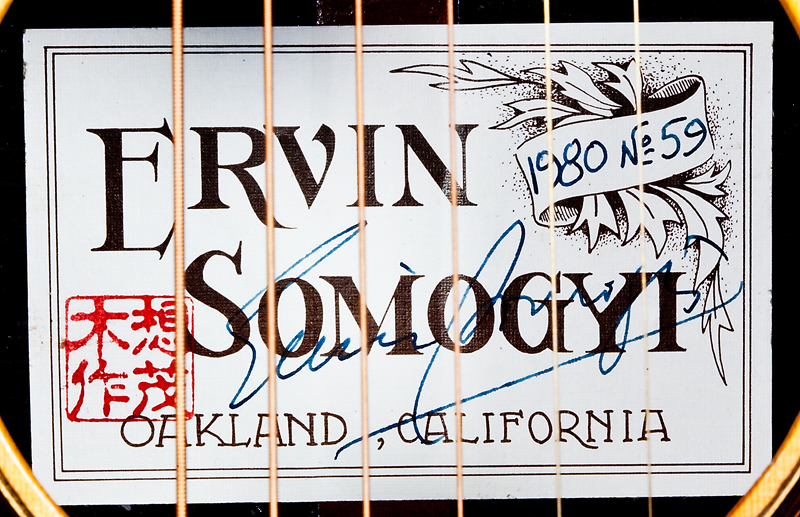 Guitar by Ervin Somogyi, Oakland, California, April 1980. Modified Dreadnought model. Serial number 59. 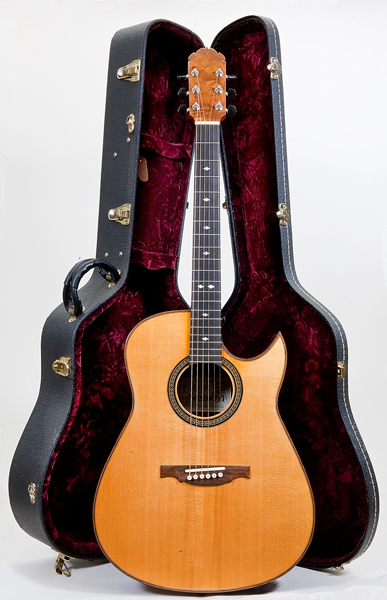 Gift of Dream Guitars, Weaverville, North Carolina, 2009. 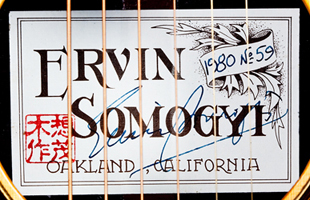 Ervin Somogyi, who immigrated from Budapest as a teenager, built his first guitar in 1971. 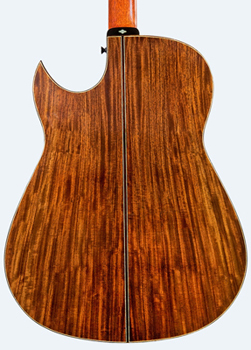 He is widely respected as a luthier and instructor, and has published several books, as well as numerous articles about guitar making. His instruments command a premium as fine, hand-built modern American guitars, notable for their exceptional materials and workmanship. 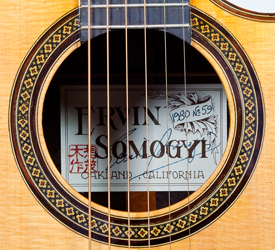 While this guitar is a relatively plain and early example, Somogyi’s later works have included extensive decoration in the form of inlays and delicately carved, lute-like roses. These techniques are also evident in Somogyi’s decorative artworks. 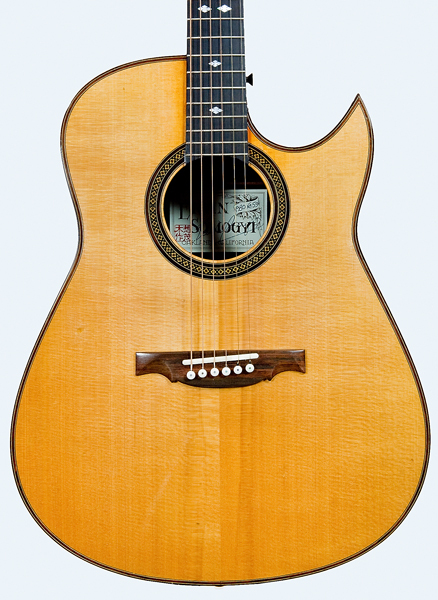 The modified dreadnought is a signature Somogyi model, incorporating the influence of the classical guitar in the placement and tapering of the waist. A cutaway enables accessibility to the upper fingerboard, which facilitates a wide range of playing techniques. Rosette: dyed hardwood mosaic surrounded on each side with two bands of rosewood and light hardwood, and black-stained hardwood strips. Head: Spanish cedar peghead veneered with burled, open-pored light hardwood over black hardwood; scarf jointed onto neck under veneer. 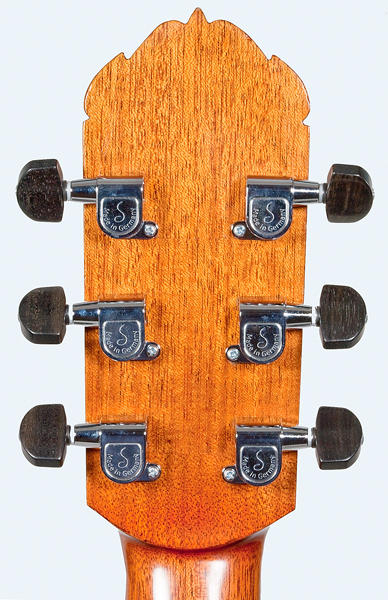 Tuners: six chrome-plated-steel, Schaller-covered, worm-gear machine tuners with ebony heads. 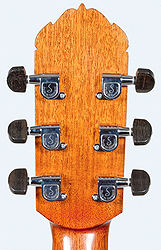 Fingerboard: ebony; 21 nickel-silver frets; single-slotted diamonds behind 3rd, 5th, 7th, 9th, 15th and 18th frets; double-slotted diamonds behind 12th fret. 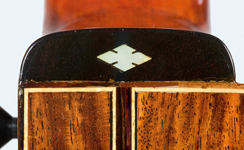 Heel cap: ebony inlaid with mother-of-pearl, slotted diamond with light and dark hardwood trim on inside edge. Soundboard: two-piece spruce, fine grain. 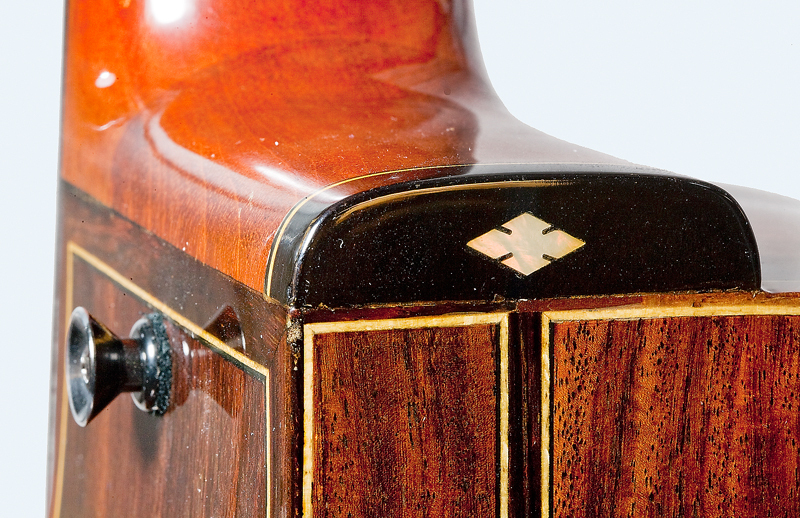 Back: two-piece, book-matched, figured Indian rosewood; rosewood back stripe surrounded on each side by light and black hardwood strips. 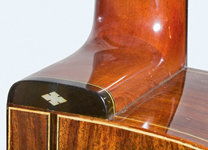 Ribs: two-piece Indian rosewood divided by rosewood end graft surrounded on each side by light and black hardwood strips; end graft wider at top; four small rosewood plugs in bass rib near neck (under finish). 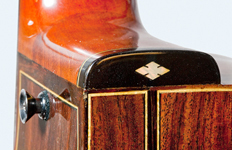 Binding: rosewood with rosewood trim surrounded on each side by light and black hardwood strips on top and ribs; rosewood with light hardwood trim on back and light and dark hardwood trims on ribs. 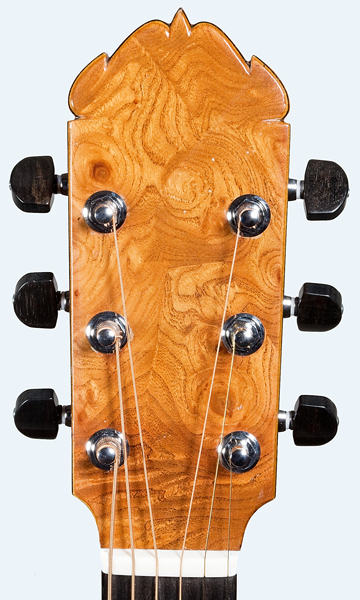 Neck block: Spanish cedar; rounded profile. End block: Spanish cedar; rounded profile. 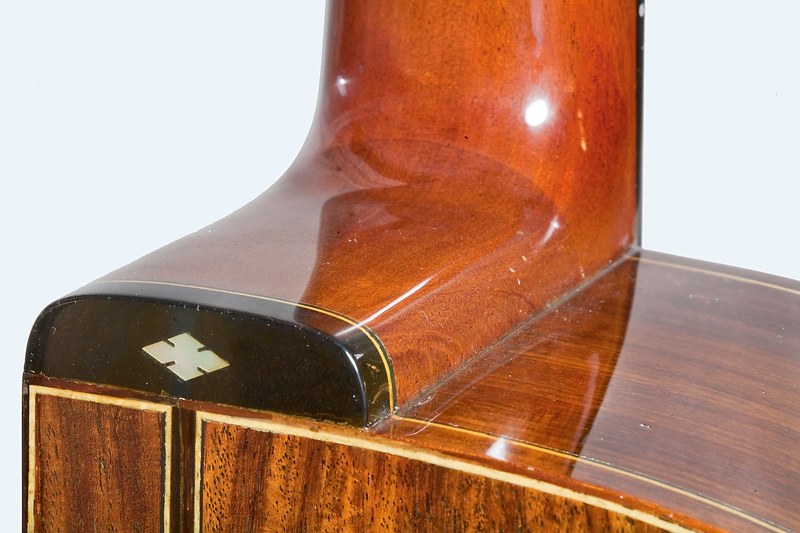 Top braces: spruce X-brace; cross braces above and below soundhole; two transverse braces below X, two transverse braces on each side of X; rosewood bridge plate. 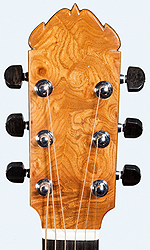 Back braces: Spanish cedar back graft; three Spanish cedar back braces. Bridge: Brazilian rosewood with belly and decoratively carved lower edge; bone compensated saddle; bone pins with abalone eyes.